This is a self-service Independent Home managed by OYO. We have a 24x7 in-house caretaker at the property to assist you during your stay. Home is one word that sums up the essence of Home Designed 2BHK in Trivandrum. 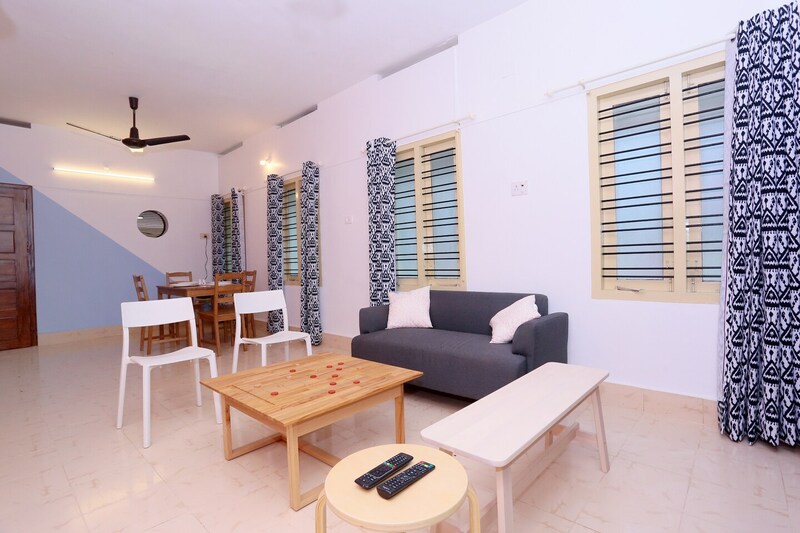 Beautiful house with a minimalistic decor and spacious rooms, it is a perfect accommodation to spend your vacation. Rooms are equipped with modern furnishing, comfortable sofas, wooden furniture and cabinet. The house is painted with soothing colours and has windows that ensure ventilation. The kitchen has basic amenities and utilities kept at hand for use. Guests can enjoy a morning cuppa on the balcony with the hanging birds nest offering a chance to connect with nature.